Heading home after a day at the World Marmalade Awards, smug in the knowledge that my first ever entry into the novice competition was awarded 16/20 by the lovely WI ladies. I got 2/2 for appearance, 4/5 for colour, 4/6 for consistency, texture and quality and 6/7 for flavour and aroma. The overall verdict was ‘Good flavour, rather syrupy consistency.’ I have to agree – that syrupy thing is a problem. But if I ever wanted advice on how to make marmalade, this was the place to get it. Two of the WI judges, Eileen and Doreen, were on hand for quizzing, so I asked them how I could improve the texture. Eileen suggested that I might be over-boiling it, which alters the water-to-sugar proportions and makes it too sweet and syrupy. Clearly I’ve been treating my marmalade a little roughly. So it’s back to the stove for another try. My mission is to arrive at the perfect, foolproof marmalade recipe that is carefully fine-tuned, taking in bits of advice like Eileen's, without being too complicated. Marmalade is a very simple thing to make, really – and anyway it doesn’t have to be perfect to be good. As long as the peel is cooked properly so that it’s not chewy, it’s hard to make an inedible marmalade. Every marmalade is good in its own unique way. But now I’ve got interested in the science and am determined to improve the texture. Next year I shall accept nothing less than 20/20 and a gold star on my scorecard. 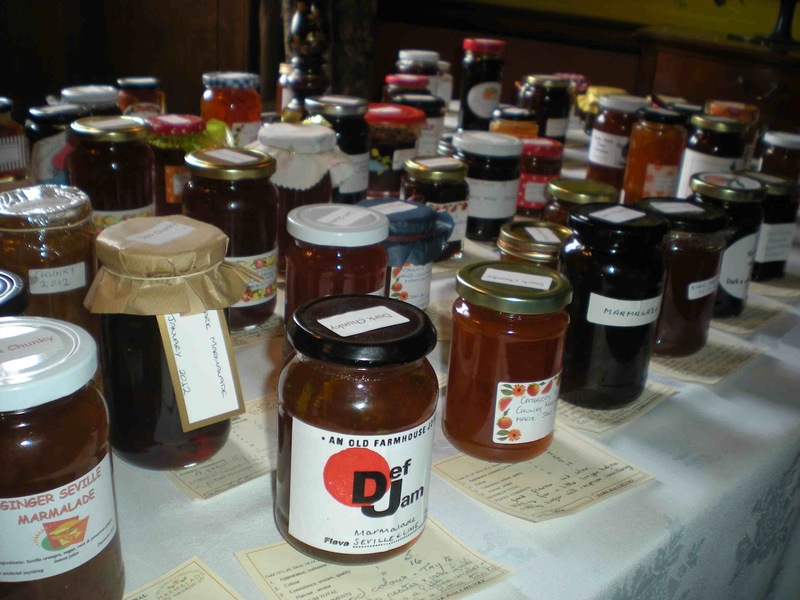 At the Marmalade Awards, the artisan marmalades (the ones made by small commercial companies) are put out for public tasting after they have been judged; the jars are lined up on tables in a long barn, with plastic spoons to hand and slices of toast for sale. It’s a kind of marmalade free-for-all. Seville Orange with Liquorice – really surprisingly good, mostly because the liquorice was very underplayed. Seville Orange with Chocolate – should work of course, as the flavour pairing is a classic, but one can’t quite imagine how the fats of the chocolate and the acidic, jellied oranges will merge. But they do. Oh, they do. Margarita Marmalade (sugar, water, lemon, lime & tequila). Fabulous because, again, very subtly flavoured with not too much tequila. Sharp and refreshing and an excellent concept. As this is a relentlessly positive blog, I won’t have a Thumbs Down list, but after extensive tasting I have resolved never to put beetroot, carrot or basil in my marmalade.